Most of my long time readers know that I am a juggler and came from a juggling family. 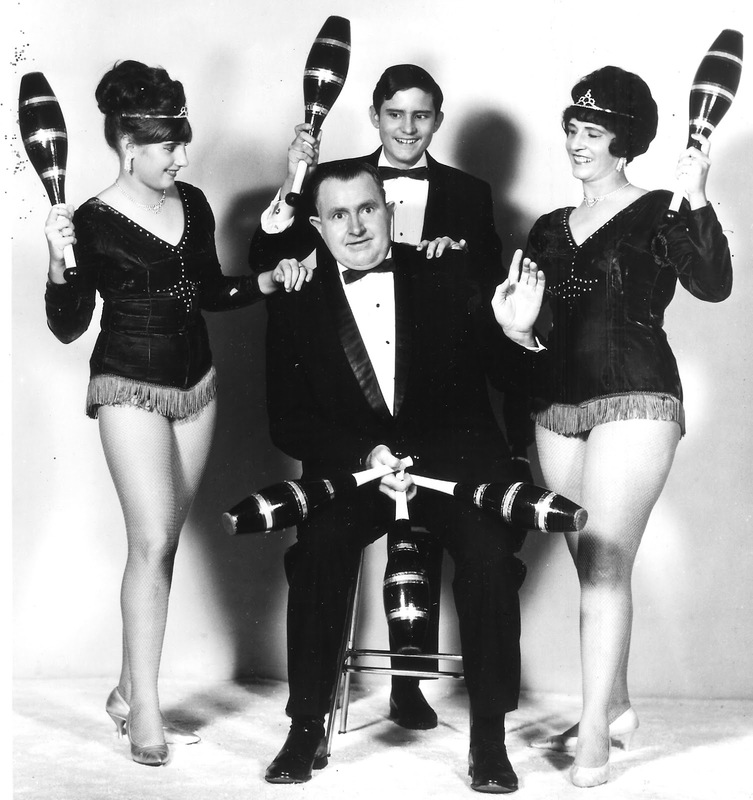 My father called the act "The Juggling Jacksons" because that was our last name. Besides the alliteration sounded good. Juggling was a sideline for us. We would have loved to do it full time, but my father wisely chose the security of a regular daytime job. His career was as an accountant for an industrial contractor. And though he juggled books for a regular paycheck, his true passion was juggling objects. So what's this have to do with marketing and promotion? We always had an agent or agents who booked shows for us, but as is often the case with anyone who has an agent sometimes you have to get out there and do things yourself to get the ball rolling--or in our case the balls and other objects tossing. We practiced our act regularly to stay in top shape for our performances. Stage attire and props had to be kept maintained. My father was always on the lookout for new gimmicks to make our act stand out. He put a lot of thought, time, and sweat into making our act marketable. Like The Juggling Jacksons you and your business have a juggling act underway. Some of you may be working jobs to pay the bills while you work at trying to get your passion off the ground. You are juggling family and relationships, job, education, health, relaxation time as well as the dreams of success in whatever it is you are trying to achieve. Then there is the juggling act of your marketing efforts. What do you need to promote what you are doing? Photos, brochures, resumes, and other media? How about conferences, trade shows, or other events that will further your reach? You juggle time, money, and personal well-being and hope your act will reap some benefits of what you've put into it. Marketing can be a real balancing act for sure. Plan your act carefully. Practice the tricks you'll be using and then when you're ready you can hit the stage and perform before a real audience. One thing you don't want to do when you're in the spotlight is drop the balls, but if you do just pick them up and act as though it's part of the act. What are you juggling in your life? Have you achieved balance? Jenny Hansen's blog is More Cowbell. If you don't get the reference and don't fear the reaper I think you'll find out where her blog title comes from if you go there and look around. Reversing the initials we also have Hart Johnson who blogs at Confessions of a Watery Tart, the blog where no pants are allowed and naked people get in free. Are we bloggers a wacky bunch or what. Finally, Michelle Jones at The Family Tales is offering a give-away at her blog. Head over to her blog and you may be a lucky winner of a a new customized blog design and/or custom header graphic. The graphic design will be created by fellow A to Z blogger, Lisa Campbell. I love to hear about your juggling days. Thanks for a wonderful post. While I was interested to hear about your juggling past Lee, I must admit I did find myself wondering how you would tie in juggling and business but you did so and did so wonderfully, great post mate. Sounds like a fascinating and fun background! I think it's impossible to achieve true balance. You can't keep all those balls in the air all the time, but life is about trying. Always remember my attempts at juggling. It is always fun to try! What concentration it needs! Thanks for the interesting post. I unfortunately have not found balance, yer. Everything is up in the air at the moment, but this is some really sound advice for marketing. I thought you were going to stray from your marketing theme and was going to say, of course you would choose juggling as your J word. But you tied it in beautifully, Lee. i think i am still working on that balance thing---great idea post! Balance is a work in progress for me. Everyday brings a new challenge. Another great connection between marketing and another activity. Another point is not to have too many balls in the air. Goes back to your focus post. Mostly I'm juggling my two careers -- being a designer and a writer. Both are going fairly well but trying to find balance is a challenge. Yes, juggling. But also ratcheting around, which is more like what I do. I catch up in one area, fall behind in the next. That's life, I suppose. Yep. I knew it. Thought I'd stop by and say hello and sure enough Juggling is the word for the day. I'm always juggling stuff in life. I'm just a guy trying to get stuff done. I would be disappointed if you didn't use juggling for J. I must say that is the most adorable photo. I juggle life and don't do it well. I would have liked to seen the Juggling Jackson's. I hope to see and meet this Jackson one day. We could be related. On my Mother's side, Jackson's married into the family ages ago. You never cease to amaze, Lee. What a wonderful surprise, that you're a juggler from a juggling family. I enjoyed how you tied this great post together. Seriously, you were in a juggling act? That's awesome. I cannot believe that. What a cool talent. teehee--thank you for the shout out, Lee! And you know, the closer I get to book release, the more I know you are absolutely right about this juggling thing--it's INSANE! Balance? What on earth is that? Just glad I'm not planning on a full time author career. Enjoyed the post, Arlee, as always. Yes, juggling is an art that I just have not mastered yet. Slowly, I am getting there. Most of last year, I was ill with something, but I feel stronger and more secure with the direction I am going in. You're right, Lee, about juggling. Life is a constant juggle! Thanks for hosting A to Z Blogfest! What a fun Geneaology Juggling Story and great photo. From what I see with your multi-blogs, you have learned your lessons well and A to Z is just another Act to Juggle...Well Done! I'm juggling the usual - job, family, friends, writing, hobbies, etc. One thing I've finally learned is that I can't do everything, and sometimes I have to let certain things go and NOT feel guilty about it! I feel like I'm juggling all the time between family, day job and trying to make it as a writer. Things do get dropped. I love this post about juggling, and I love Jenny Hanson's Cowbell. She's amazing! You know, I will argue that juggling is one of the must useful skills I ever forced myself to develop. As a kid of 15 or so, I just decided one day tht I wanted to juggle, so I got myself some tennis balls, and locked myself in my room until I could do it. Tennis balls are NOT the item to learn with by the way, I spent so much time bending over chasing them and what not, that I pulled my arse muscle. Oh crap... I forgot to mention why I thought it was a useful skill. Hi Lee - great post .. certainly ball juggling is part of normal life. Your family group sounds as though it was highly professional, uptodate and fun .. and I'm sure that's where you learnt so much .. Marketing at all times of life is critical - to achieve we need to market ourselves ..
that was quite an interesting post. I really liked the way you explained things we have to care about in life through the juggling metaphor. Besides a jugglig show amazes me no ends, so it's good to hear about it. Hi Arlee! Great post. I really had no idea you come from a juggling family. How cool! I'm always trying to juggle things in my life. But I never seem to reach the happy balance I'm looking for. As long as I don't quit trying, I figure there is hope for me. Thanks to all for your comments on this post. I've been falling behind on leaving replies to comments, but you can probably guess why. Yes the above is a true story about my juggling family. I really appreciate all of the kind words in your comments. I was going to pass by without commenting on this post Lee, but came back to say did you know juggling is one of the skills recommended for us to learn as we age? Balance, dexterity, concentration, and a certain element of being able to laugh at yourself and heaps of other good things for the brain are involved! I can see where juggling would be good for balance, dexterity, and mental acuity. I probably need to start juggling more often.